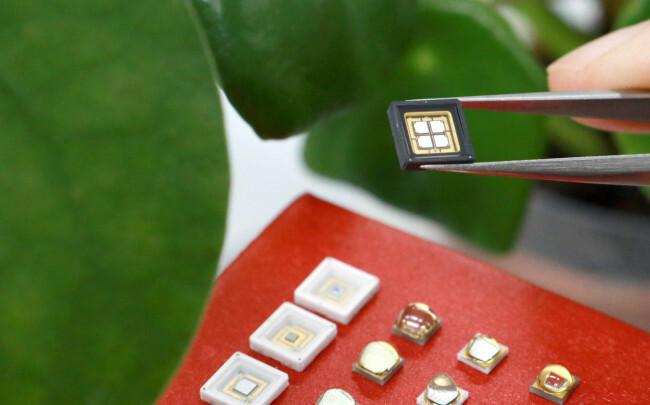 LG Innotek, a South Korean manufacturer of optical electronic parts, has unveiled a full lineup of LEDs generating light sources that grow plants faster than the natural sunlight. Named “Horticulture LEDs,” the products are a semiconductor light source that can control plant growth rates and increase the nutrient content of the crop by using the light of a specific wavelength, the company said in a statement. “This product was developed considering the characteristics that the physiological responses, such as photosynthesis and flowering, vary depending on the wavelength of light,” it said. LG Innotek’s 380nm wavelength UV-A LED can be used to enhance the phytochemical content of antioxidants such as anthocyanin and lutein, while 405nm wavelength LEDs that emit purple light can thicken the leaves of the plant and make the color sharper, it added. The company aims to make inroads to Europe, North American and Asia. This year, it also plans to launch an additional 730nm near infrared LED which can increase the content of specific ingredients, such as sugar in crops and saponin in ginseng, officials said.